I love this classic English dessert, it’s quick and easy to make and so yummy. Why not have a go at making this yourself? A delicious English dessert that everyone will love. First hull the strawberries, then chop half of them and place them in a Mini Chopper or blender with the icing sugar. Whiz them to a purée and then pour the purée into a nylon sieve, over a bowl, and press the purée through the sieve to remove the seeds. Now chop the rest of the strawberries and whip up the double cream to the floppy stage. What you do with the meringues is break them up into small pieces into a large mixing bowl. Then add the chopped strawberries and fold in the cream. Next, carefully fold in all but about 2 tablespoons of the purée to give a sort of marbled effect. Finally, pile the whole lot into serving dishes, spoon the rest of the purée over the surface and serve immediately. For those of you who don’t like strawberries, raspberries are just as effective, and just as tasty! To give it an extra special zing, add a dash of port or a tablespoon of Cointreau to the purée. 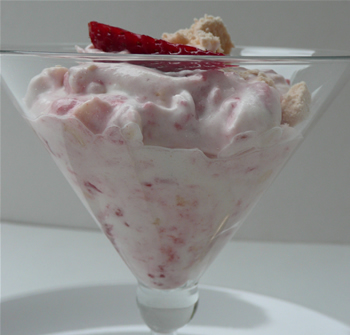 Eton Mess is worth making! I have tried it and loved it, mind you I was spoilt and had Carlie herself make it for me….The threats worked eventually! So give it a go peeps…..That’s making Eton Mess and not threatening Carlie!! For those of us in the US, what is icing sugar? I am assuming it is a powdery white sugar. Other question, what is a meringue nest? Yes, you’re right, icing sugar is the powdery white sugar. Meringue nests are just meringues shaped into a nest about the size of a normal mug rim. You use pre-cooked meringues and if you can’t them shaped into nests then try and estimate what is available based on the size mentioned in the previous sentence. p.s. sorry for delay in replying!